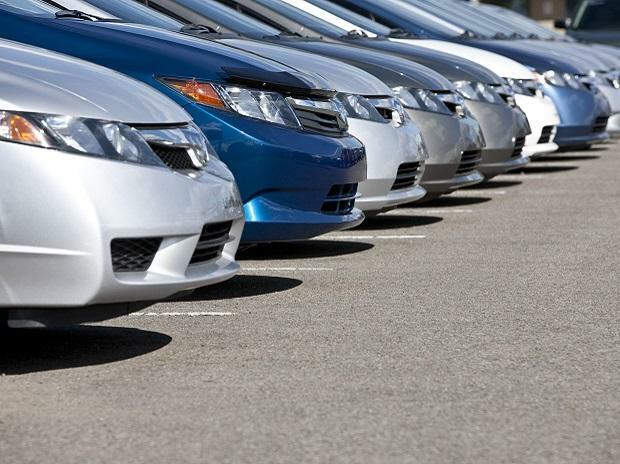 Carmakers have reported an unusually high double digit volume growth in domestic sales for June on a low base of previous June. Domestic volume of passenger vehicles (cars, vans and utility vehicles) in had slipped more than 11 per cent to 198,399 units in June last year as manufacturers consciously regulated dispatches to dealers to minimise losses arising out of the transition to the goods and services tax (GST) regime from July 2017. 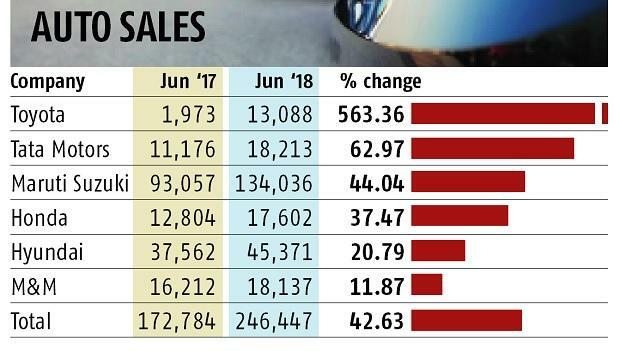 Data available from top six players — Maruti Suzuki, Hyundai, M&M, Tata Motors, Honda and Toyota — shows an average growth of about 42 per cent for the industry in June. The combined sales of these players stood at 246,447 units last month against 172,784 in June, 2017. Players like Ford, Renault and Volkswagen did not announce their sales number on Sunday. Maruti Suzuki had reported a volume increase of just one per cent in June last year. Domestic sales in June this year are, however, up 44 per cent to 134,036 units. However, a comparison with May, 2018 shows that the month-on-month volume of market leader is down 17 per cent. The company had shut down its plants for a few days last month for maintenance work, resulting in a production loss. The situation of low base was not unique to Maruti Suzuki, which has a market share of about 53 per cent. Korean car maker Hyundai, the second largest player, reported a 21 per cent growth in June. Sales stood at 45,371 units for the month. In June, 2017, it had reported a decline of over five per cent. However, month-on-month growth was flat with May sales at about 45,000 units. Third largest player, M&M, had recorded a decline of about five per cent in sales in June last year. This year, it is up 12 per cent to 18,137 units. There were also voices of concern in the industry. “We hope that macro conditions such as fuel prices, interest rates and raw material prices remain at satisfactory levels to enable us and the auto industry to grow in the coming months,” said Rajan Wadhera, president, (automotive sector) at M&M. Tata Motors sold 18,213 units with a growth of 63 per cent YoY. That also makes it a third player, ahead of M&M at least for June. For the Q1, however, M&M leads with a volume of 60,779 units against Tata Motors’s 52,937 units. Tata Motors is eyeing a third position in domestic passenger vehicles market. While most companies did not elaborate the reason behind this surge in June 2018 volumes, Japanese brand Toyota attributed its three digit growth to a base effect. N Raja, deputy managing director, Toyota Kirloskar Motor said, “We have achieved triple digit growth this month as compared to June 2017 owing to last year’s GST scenario, wherein we supplied as per the market demand which was impacted due to impending GST implementation”. Against a volume of just 1,973 units in June, 2017, the company sold 13,088 vehicles in the domestic market. The company had seen a decline of 85 per cent in June 2017 volumes. Toyota’s Japanese peer Honda sold 17,602 units in the domestic market, growing more than 37 per cent over the same month last year. The growth was helped by its new Amaze sedan, which clocked a volume of 9,103 units in June.